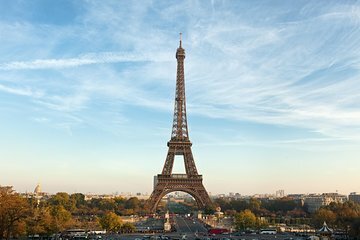 See Paris and savor a Champagne lunch on the Eiffel Tower on this day trip by Eurostar from London. Travel by Eurostar train from St Pancras International and, on arrival, take a panoramic coach tour of top Paris attractions including the Champs-Élysées and Opera House. Then, after a glass of Champagne and 2-course lunch at a chic Eiffel Tower restaurant, enjoy a 1-hour Seine River cruise and either a guided visit to the Louvre or time at leisure. Upgrade to first-class Eurostar travel, including breakfast and dinner. This Paris day trip amps up the luxury with a 2-course lunch and Champagne at the Eiffel Tower. Select Eurostar standard or first class travel when you book. Then, travel independently to London’s St Pancras International station, meet your friendly guide and settle onto your comfortable, air-conditioned Eurostar train. Sit back and relax as you journey to Paris in a little more than two hours. If you’re traveling first class, savor a delicious breakfast served to your table, and then dinner aboard this evening. On arrival, hop inside an air-conditioned coach for a panoramic Paris sightseeing tour. Have your camera poised as you pass top Paris attractions such as the Opera House, Arc de Triomphe and elegant Champs-Élysées, and learn about the city's rich and long history from the engaging guided commentary. Then, head for the world-famous, 19th-century Eiffel Tower, Paris' most iconic monument, for your delectable Champagne lunch. 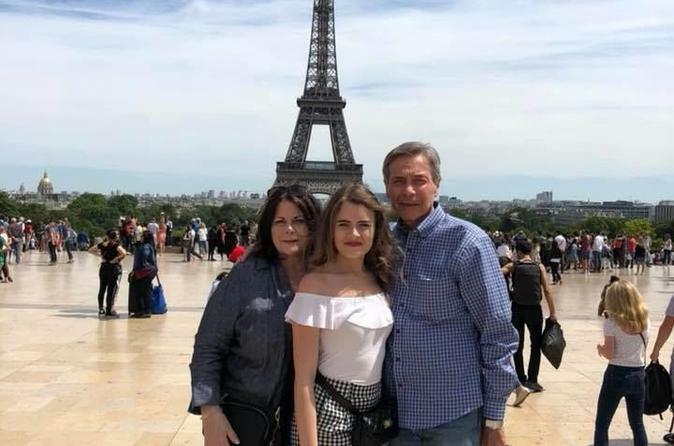 Show your priority-access ticket to avoid any long entry lines, and ascend via the elevator to the chic 58 Tour Eiffel restaurant, located on the first floor. Take your seat and sip on a glass of chilled Champagne. Feel the bubbles tickle your nose, and feast on an appetizing 2-course lunch as you absorb the bird’s-eye views over the city spread below. Read the Itinerary below for a sample menu. Then, enjoy a scenic 1-hour cruise on the Seine River. Take photos and hear the interesting commentary as you glide by landmarks such as Notre Dame Cathedral, and drink in the riverside sights. Afterward, opt to use a spell of free time as you please. Perhaps enjoy a guided visit to the Louvre (own expense) to admire art treasures such as Leonardo da Vinci’s Mona Lisa. Or delve down Paris' handsome boulevards and lanes to shop at upscale boutiques, snap up gifts or unwind and people-watch at a sidewalk cafe. Lastly, head back to the railway station in time for your return Eurostar train. Your day trip then concludes at St Pancras in the evening. My family had a great day on our tour! I’d highly recommend for anyone thinking about taking this tour! Charlotte our guide was amazing...and she made our experience that much better! 5 stars! My experience was very good but the service of Diané, the driver, was outstanding. When I was in the Louvre Museum I forgot my prescription glasses and he had the courtesy to find it and bring it back to me. Muchísimas gracias! Listen even if you read the fine print and ask questions during the recorded conversation while booking, be careful. This luxury Paris day trip delivered a sad and disappointing tour. My daughter was in tears when she found out on the train that we would not be having lunch on the Eiffel Tower as promised (I called twice the week before to verify all the attractions included and was assured that we would be getting breakfast and dinner on the train to and from, lunch on/in the Eiffel Tower, and a skip the line/guided tour at the Louvre, in which I paid additional $$$). None of which occurred. Started with the train ride there and throughout the day. There is know one to assist you, the guide will tell you there is nothing he/she can do. So you're on a train to Paris and there's nothing you can really do about the situation. If it wasn't for the wonderful people we met on the tour it would have been a total loss. If you find yourself in this situation, do the best you can at the time, find the blessings and deal with it when you can. Pretty much everything that could have gone wrong with this tour did. While our tour guide was extremely nice, I really don't feel what got enough value out of it to justify what we paid. The Eurostar train was late (no one's fault), which caused us to miss the Seine cruise (including lunch, which was supposed to be provided to us). We had to find lunch on our own --- literally strangers in a foreign land, trying to find our way around. Definitely not what we expected. Good thing we had brought Euros with us as we had not expected to have to buy our own lunch. And while we did get to see the Eiffel Tower, the chance for us to go up the tower was canceled even before we booked the tour. Yes, we knew this ahead of time, but as I understand it, it was all due to poor planning on the part of the tour organizers. The rest of the day was just riding in a bus. Sure, we saw great sites, but we didn't even so much as get off the bus to look at the sites in person. Overall, we were very displeased with how unorganized this day was and how there were absolutely no backup plans. Very disappointing! Enjoyed the trip for the most part however timing became an issue. Lunch at the Eiffel Tower seemed rushed because of our group’s late arrival and the long wait to get through security. Eiffel Tower time after lunch for photo ops and the like was pretty much non-existent as we had to get back to the bus to move on to the Louvre. Tour guide did not add much to the experience. Believe this tour is overpriced for what it delivers. Would recommend eliminating one part (Louvre?) to allow for more quality time during the rest of the day. The trip was great, the tour company was a little unorganized as they showed up later than the meeting time to pass out tickets for the Euro-star. Our tour guides were pleasant and knowledgeable. I loved the service on the Euro-Star. The day trip form London Paris was a excellent trip. The day went very smooth as planned. My tour guide was very nice and knowledgeable and caring. The only thing I was not to happy about was the lunch on the tower. It was all that, service was not what I expected but other than that it was worth going with the tour. Tour guide was late in telling us what we are passing instead of giving us time to position our cameras before we got there. Having time to replenish water supplies during stops was too short to look for those places.